The portable round garage will solve your storage needs. With a 15 x 28 interior and 10 foot door height, you will be able to protect your equipment and vehicles. The sturdy beam steel frame has been tested to withstand harsh conditions and the powder-coated finish will prevent it from rusting and peeling. Also, the triple layer polyethylene cover is built to protect your equipment from the elements. This sturdy structure comes with slip fit connectors and swedged tubing to allow you to easily assemble and begin using this garage. 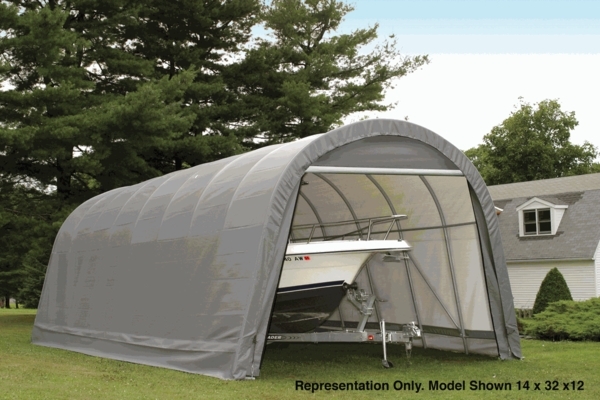 Does this ShelterLogic 14 x 28 x 12 round portable garage canopy come with front and back, close-able doors and rollers? Can the front flap of this ShelterLogic garage canopy be removed to give more height? I need 11 feet and 3 inches in the center to clear an air conditioner. The front door of this garage canopy is actually a separate piece so you can choose not to install it if you prefer. What kind of snow and wind resistance does this unit protect against? It does not carry a wind or snow load rating. The manufacturer recommends that you keep the snow from building up on top of the structure with a soft bristled broom or mop. We do have wind and snow load rated shelters of this type. 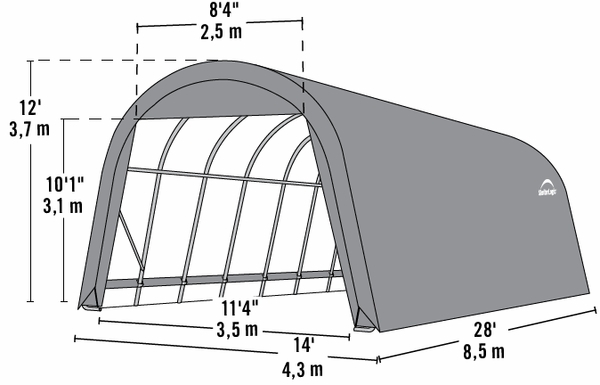 We carry are the ShelterTube shelters by ShelterLogic. These are available in both gray and green in sizes of 12 x 20 x 11, 12 x 25 x 11 and 12 x 30 x 11. They can resist winds up to 80 mph and snow/ground loads of 43 pounds per square foot (when used correctly). how high is the front top cross bar? in other words how tall a vehicle can fit in? The opening on this unit is only 10'1" tall. I would believe that most vehicles would be able to fit under the doorway without a hassle. Do you make anything that I could use as a salt pool enclosure? I could use something like your #95333 garage, but short? Perhaps 4' to 6'? Since nothing is stored inside, horizontal bars (forming something like a truss) would be acceptable. Do you have anything like this? Do you custom make any enclosures? Could they be erected and then moved over the pool? I'm looking for ideas so we can swim in the winter time. The enclosure would be put up in the fall and taken down in the spring. Our shelters do not come any shorter than 7 or 8 feet. We can double check this specification if you could provide your other dimensional criteria.